IODP drilling of marine sediments provides the unique opportunity to sample otherwise inaccessible archives, offering insights to Earth history unobtainable through other means. Paleomagnetism, the study of Earth’s magnetic field recorded in geological materials, is often used to date these drilled records employing an approach known as magnetic stratigraphy. Polarity reversals, polarity excursions, intensity variations, and directional changes can all be recorded in marine sediments, providing a variety of stratigraphic approaches for dating geological materials. These paleo-geomagnetic records also constrain our understanding of geodynamo processes that drive Earth’s magnetic field and provide direct insights into the paleo-magnetosphere that shields Earth from cosmic rays. 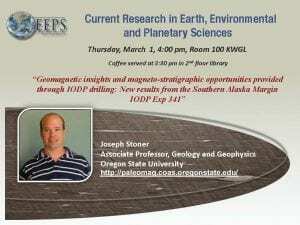 Because sediment paleomagnetic records preserve a smoothed version of the geomagnetic field and because the largest extreme events like polarity reversals only occurred in the more distant past, ocean drilling is required to step past these difficulties and obtain critical observations of the paleo-geomagnetic field, such as high-resolution time series of directions, intensities and field instabilities (e.g., reversals, excursions). Additionally, the geomagnetic field is not globally uniform. Therefore, our understanding of geomagnetic change is limited by a lack of observations from regions of the globe where high quality records have not been drilled. The northeast Pacific is one such region, as it lacks quality paleomagnetic records and has been difficult to date using traditional Quaternary marine sediment methods. As a result, detailed magnetic stratigraphies would greatly benefit the region. A concerted effort on sediments collected during Expedition 341(Southern Alaska Margin Tectonics, Climate and Sedimentation) is allowing a series of long, high-resolution paleomagnetic records to be developed through a wide range of field states (e.g., higher and lower intensities than present, reversals, excursions) that are facilitating an improved understanding of the geomagnetic field and the time control it enables. 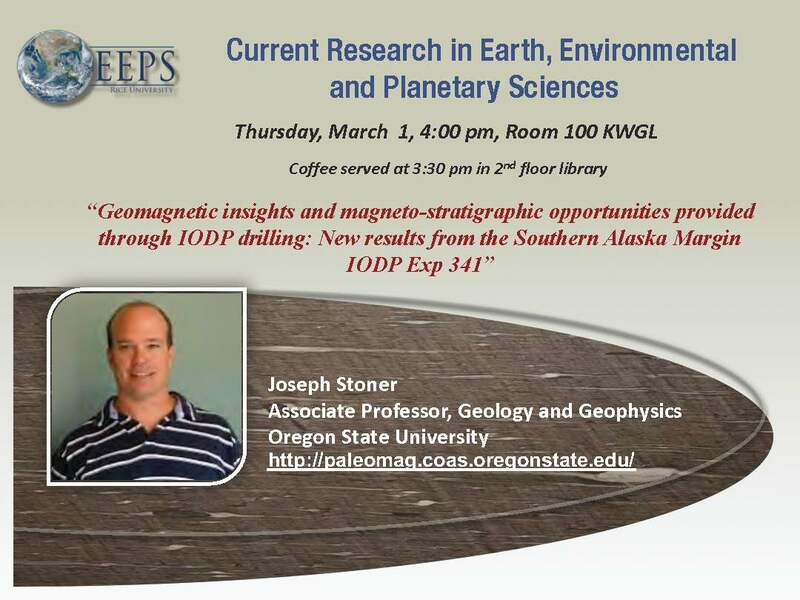 These studies outline the symbiotic relationship between paleo-geomagnetism and drilling that are critical if we are to understand Earth’s magnetic field and its past.